Between 26.04 - 06.05.2019 is the Easter Holiday. The Academic Records Office only releases BA/MA diplomas (accompanied by diploma supplement) obtained by Romanian-American University graduates. Romanian-American University students which did not yet graduate are kindly asked to address the school's secretariats for any other documents. The situation below refers to the study programs taught in English. 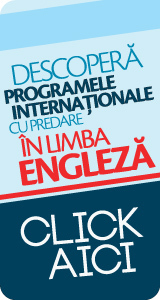 For the situation of diplomas referring to the study programs taught in Romanian please check the dedicated page. - ID Card (valid, original) for Romanian citizens and valid passport for foreign citizens (valid, original); marriage certificate or other document attesting a name change, if this happened after the graduation moment. What types of educational documents can be issued here? Academic records are official documents issued by the government, which confer to the holders an entire set of rights and obligations, coming from the Education Law no. 1/2011, with all subsequent modifications of the Government Resolution no. 44/03.02.2016, regarding the organization and functioning of the Ministry of National Education and Scientific Research, published in the Official Gazette of Romania, Part I, no. 99/09.02.2016, with all subsequent modifications, to the Order of the minister of national education no. 657/2014, for the approval of the Regulations regarding study documents regime in higher education system, published in the Official Gazette of Romania, Part I, no. 874/ 02.12.2014. According to the OMEC no. 4868 of 07.08.2006, regarding the Diploma Supplement, graduates that finished their studies starting with July 2006 receive the Diploma Supplement for free, as a mandatory annex to the BA Diploma. The newly introduced document is designed according to the European standards, being published both in Romanian and English, with rich information content. Among others, the document refers to: study domain, specialization, title awarded, status of the institution, study language, level of study, requirements of the study program, description of the study program, grading system and graduate ranking within his year, access to further studies, after graduation. The last page contains information about the national education system, a diagram of Romanian educational system and a description of the higher education system. Academic records are issued to the holder in person, in original, only once. If the owner of the records cannot come himself to pick up the documents, he can send an empowered, based on a proxy for this purpose, authenticated by a public notary from Romania or by the Romanian Consular Service in the country where the owner is located. In case that, after graduation, a name change occurs, the owner must also specify the name used during the study period. A copy of the owner's ID card must be annexed, and the empowered must present the ID specified by the proxy. - Receipt for the duplicate fee paid at RAU cashier desk - (see Fees section). The duplicate of a study document is usually issued only once. Keep the academic records in good conditions and avoid submitting them to different application cases. Do not use plastic coating for the documents, because authentication can become difficult. All fees for academic records are to be paid at the RAU cashier desk, the equivalent in RON, at the exchange rate of the National Bank of Romania, from the payment day. All RAU fees are available in the Fees section of our website.